Melbourne’s High Tension have announced a debut tour across the East Coast of Australia this March to launch their self-titled 7inch/Digital EP. Featuring ex members of Young & Restless (Karina Utomo – vocals, Ashley Pegram – guitar), The Nation Blue (Matt Weston – bass), and Love Like Electrocution &Heirs (Damian Coward – drums), the band have already made their presence felt despite a relatively brief existence. Inpress Magazine declared High Risk High Rewards to be “beautifully brutal” beforeTriple J jumped on board adding the track to full rotation. Check out the video for High Risk, High Rewards here! 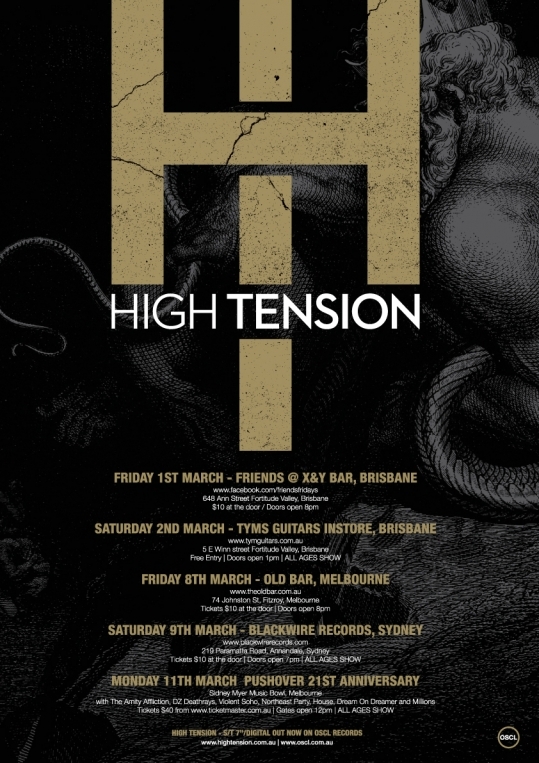 Be one of the first to catch High Tension live when they hit venues in Brisbane, Melbourne and Sydney this March.